The revenues of the general fund are set at 839.8bn hryvnyas, expenditures at 906.7bn hryvnyas. 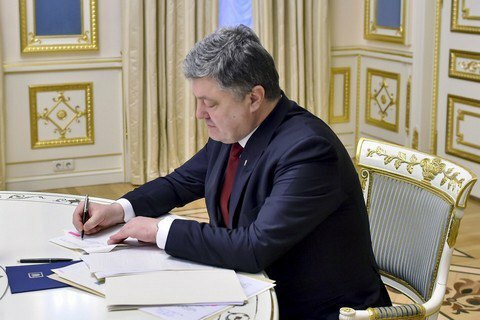 Ukrainian President Petro Poroshenko has signed the bill into law "On the 2018 state budget" (No 2246-VIII), according to his official website. Parliament adopted the bill on 7 December and handed it over to the president on 22 December. The revenues of the general fund are set at 839.8bn hryvnyas, the revenues of the special fund at 73.8bn hryvnyas. The expenditures of the general fund are set at 906.7bn hryvnyas and those of the special fund at 81.9bn hryvnyas. According to the law, the deficit is capped at 81.8bn hryvnyas (previously 77.9bn hryvnyas), including that of the general fund, 61.7bn hryvnyas, and that of the special fund, 20.1bn hryvnyas. The state debt by the end of 2018 is capped at 1,999bn hryvnyas. The estimates are based on the forecast of a 9-per-cent inflation and a 3-per-cent GDP growth while nominal GDP is expected at 3,332.3bn hryvnyas.